Space is replete with symbolism of every variety. Heroism and survival. Racing into orbit as a war for supremacy. A flag on the Moon. A flag on every rocket. Stars falling from the sky. Aliens standing in for anyone we don’t understand on Earth. 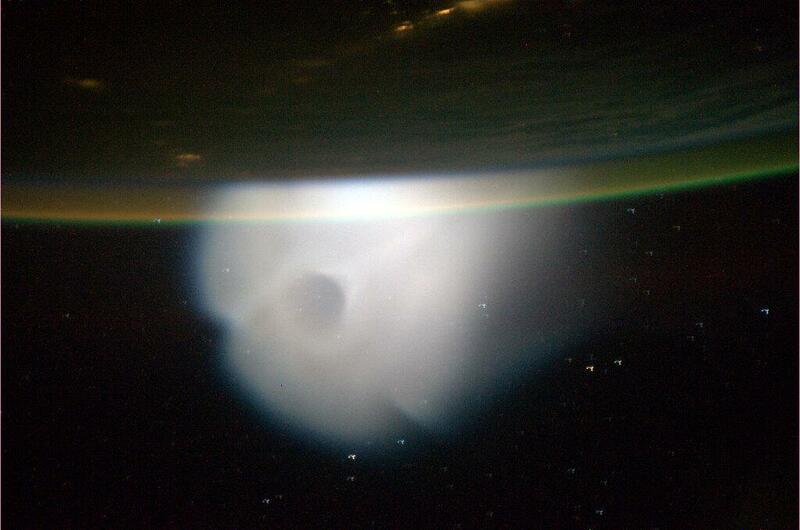 A missile-produced cloud photographed by ISS astronaut Mike Hopkins. This fall there is some very poignant symbolism on view aboard our more-than-symbolically cooperative international space station. A couple weeks ago, ISS astronauts peered out the window and spotted a large and unusual sight (see above and right). The strangely close-seeming blooming cloud turned out to be the test firing of an intercontinental ballistic missile. Although crisply clear out the window, the missile was not anywhere near the space station and the crew was never in danger. Nevertheless, one wonders what it must be like to float above the planet in a fragile, life supporting bubble on a once in a lifetime journey of a few short months, dedicated to advancing your nation’s scientific endeavors and exploratory capability with your trusted colleagues from around the globe – and to watch as one of those beautiful green continents below practices killing people. Missiles and spaceflight go back a long way, of course. All the way, really. It was intercontinental ballistic missiles that became the first rockets and paved the way to send humans into space. It was a sort of poetic justice, to derive intellectual accomplishments and open new opportunities from a tube of death and destruction. Global space capabilities leapt rapidly ahead, then slowed, now stalled. Or perhaps slipped backwards. With space budgets steadily decreasing in the US, Russia, Europe, and India, once more we are looking to the military for innovative ideas and engineering designs. Instead of NASA, we find DARPA – the US Defense Advanced Research Projects Agency – making these advances. We are still making the missiles before we turn them into rockets. Where is the future in that? Former cosmonaut Alexey Leonov, left, the first man to perform a spacewalk, passed an Olympic Torch to Mikhail Tyurin, flight engineer of Expedition 38/39 (Credits: Dmitry Chernyshenko). In another couple weeks, we’ll witness a symbol of a different kind. Two cosmonauts will carry an Olympic torch outside the International Space Station to light up the darkness of space. The torch is being sent up with Expedition 38/39 in advance of the Sochi winter Olympic games being hosted by Russia in 2014. The Olympics, the oldest forum for all nations of the world to come together in peace and compete on pure skill to make their homelands proud, represents a vision that seems eminently suited to space, where 16 nations can cooperate to perform experiments, to train astronauts, to transport them safely, and keep them alive and well. But still, there is that missile blooming out the window. I’d like to say that the missile shows our past approach to space while the torch illuminates our future, but that would be disingenuous in the extreme. Instead, I’ll point once again to the space thriller that has taken the world by storm and reignited public awareness of the existence of our space programs. A lot has been written about Gravity, in Space Safety Magazine and elsewhere. We keep talking about it because, as prior space movies have before, this film manages to excite a widespread audience about the hazards and rewards of space in a way reality rarely does. Here on our site we saw a 400% spike in Gravity-related visits from people who were just learning about Tiangong, the Soyuz, and space debris, and wanted to discover more. The movie “Gravity” tells the story of two astronauts stranded in space after their Space Shuttle is destroyed by a debris impact during their EVA (Credits: Warner Bros.). There is only so much weight one can place on a product developed to entertain, but at the same time it would be foolish to disregard the power of a skillful story to become a beacon, a rallying point calling to those passionate to explore and hungry to invent. A symbol. For what could be more symbolic than spacecraft from different nations strung like beads around the globe, providing refuge to anyone who can spot them on the horizon and reach their shores, regardless of origin, country, or creed? Maybe it’s not quite like that in real life, but as a symbol of joining together in a fight against the dark, cold, life-extinguishing vacuum of space, it’s a vision that’s hard to beat. As we all know, the best of friends are forged in response to a common enemy. So let that enemy be space. Let’s push back its boundaries, uncover its secrets, and make it our own. Let’s clean up our debris and keep launching our instruments of science and exploration. Let’s put our money into space and let’s do it collaboratively. Maybe then we can leave the ICBMs unlaunched. Image caption: A Russian missile as seen from ISS. This photograph was taken by astronaut Luca Parmitano.